Looking for clean and focused theme for WordPress that highlights your content? This article lists out of some clean and simple WordPress themes of 2018 for creating efficient website. They’re straightforward, elegant and extremely easy to use. Everything in these themes can be managed with easy customization options. Finally, you’ll have a simple yet brilliant website that highlights its purpose rather than design and features. But this does not implies that the design is not taken care of. These themes have simpler designs and clean looks. These themes are best for a WordPress beginner to create a website. Because there are chances that too many features and a complex design confuse you. So these themes are beautiful and purpose oriented. This list contains some special purpose themes as well as some multi purpose themes that can be used for various niches. You can choose the one that provides you with the features you want. The article mentions only few major features of the themes. To know more about the theme you can visit the sales page of the theme. 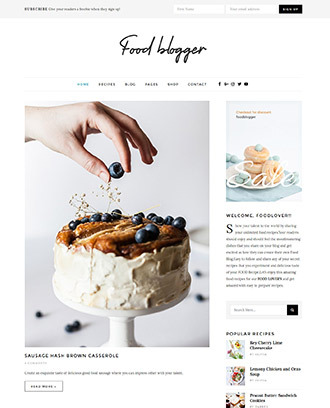 Create food blogger website with WordPress within few minutes which is ideal for creating food blogs, Sharing your receipy online, creating food tutorial website. This theme is extremely customizable and you can create a website without ever touching a line of code. So you don’t have to pay to professionals to get your website created. Have a look at these simplistic themes. 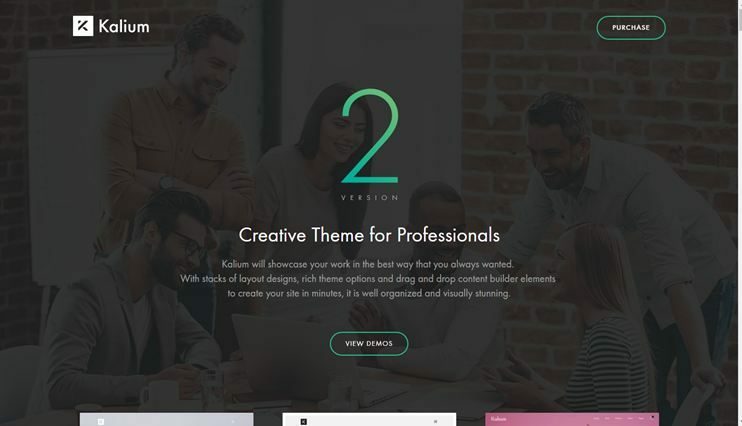 Kalium is one of the clean and minimal WordPress themes 2018. It comes with clean and beautiful design with impressive hover and transition animations. The theme has multiple styles for portfolios as well as blogs. Kalium comes with multiple demos to choose from. Create your pages with the Visual Composer page builder. You can even create a landing page website with this theme. The theme encourages your creativity. You can try different combinations and see how the website looks. As everything can be handled by easy options, it is easy to do this. Studio 8 is a flexible & simple WordPress theme. It is one of the best theme for marketing and promoting service or business, creative agencies, and web designers. This theme has all the features to showcase the work in a professional way. The theme is comes with a clean code that can be easily extended if you are good at coding. For this you can use the included child theme template. For ecommerce, the theme supports WooCommerce. Studio 8 is performance optimized. It is an easily customizable and manageable theme. 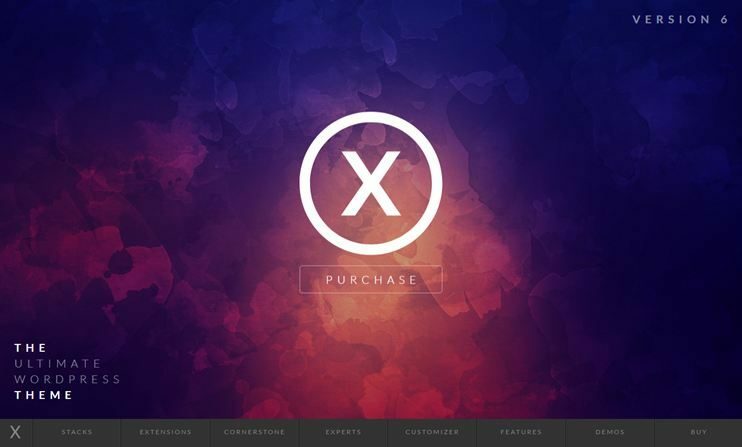 X is a powerful and minimal WordPress theme. There are four design stacks for X and multiple demos you can choose from. Each demo has a clean and purpose oriented design. The cornerstone page builder simplifies page building. It is an intuitive front end tool to change your page appearance. Editing the theme is very easy. If you are a WordPress newbie but you want to create a comprehensive and feature packed website than its best for you. Because it is highly customizable and every customization is possible with intuitive options. X supports WooCommerce, BuddyPress and bbPress. This theme is SEO optimized too. Well this theme actually does "Everything". It is a multi purpose theme with minimalist look that can be used various purposes. Everything is feature packed and optimized for fast performance. With this theme you have unlimited customization options. It allows content building with Visual Composer and shortcodes. The theme allows WooCommerce for ecommerce features. The theme is SEO optimized. 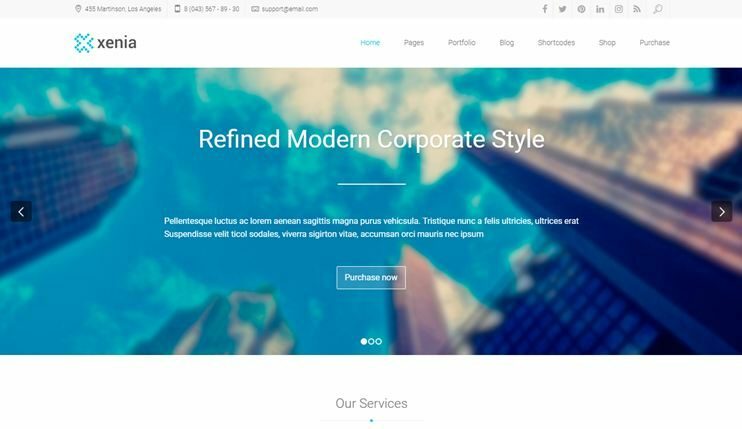 This theme can be used to create a corporate website, a creative portfolio, a website focusing on image gallery and videos, or anything at all. 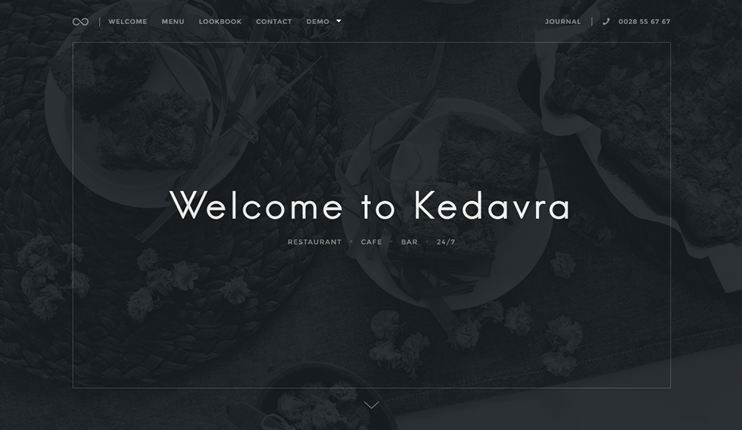 Kedavra is a multi-concept theme. It is a clean and minimal WordPress theme. You can use this theme to create a website for agency, photographer, or a corporate business website in 2018. You can choose from multiple demos. The theme allows you to create page with the drag and drop page builder. Use the live customizer to customize the theme with a real-time preview. The advanced admin panel of the theme allows you to change the website's settings. The theme is SEO optimized. 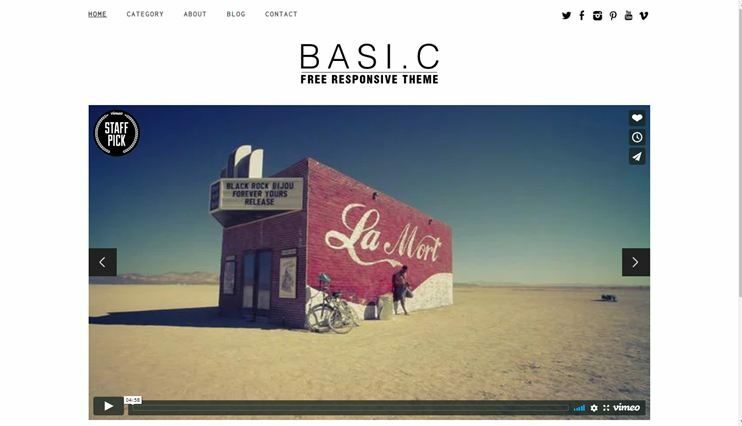 Basic is a multipurpose theme for bloggers, artist and publishers. The theme has a minimal design. With the customization options you can change the colors, background and few other settings of your website. Being seo friendly, the theme ensures that your website ranks well. It is responsive too. 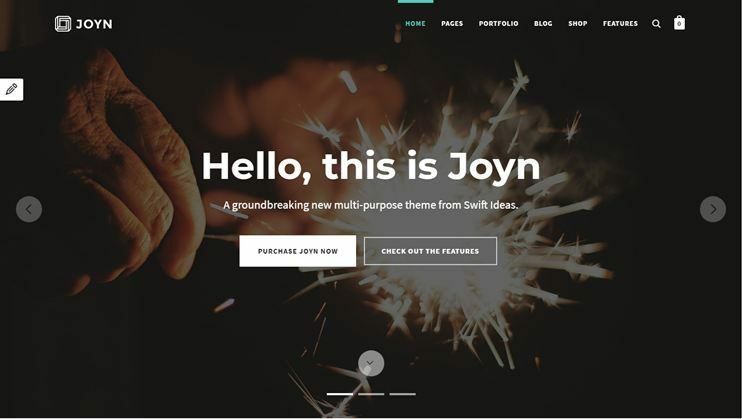 Joyn is a simple responsive wordpress theme. It is a creative theme that can be used to create a website for multiple purposes. This theme can be used for creating a comprehensive and feature rich website. The theme allows drag and drop page building with the Visual composer. It also has multiple shortcodes for website's content building. You can easily customize the theme to make it look like you want. For ecommerce features, the theme supports WooCommerce. It also provides compatibility for Easy digital downloadsand Events calendar. Joyn is SEO optimized. 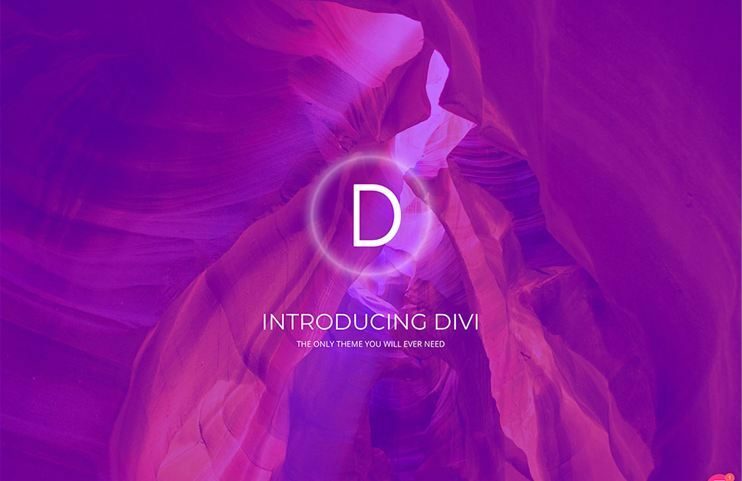 Divi is a theme with endless possibility. It is flexible, clean and extremely easy to use. 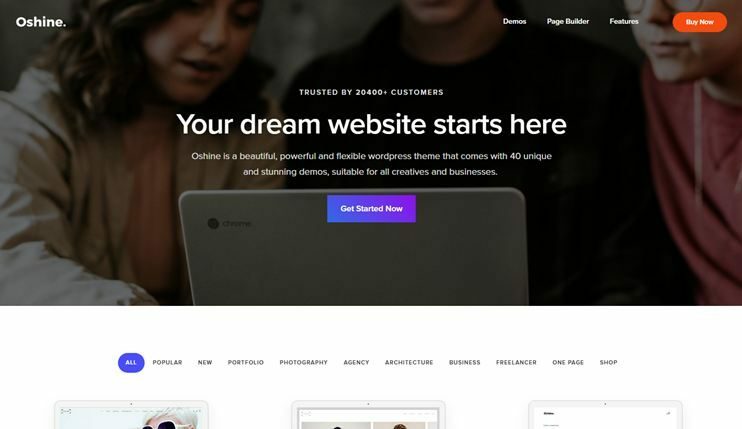 With Divi even a non technical person can create unbelievable website in 2018. Divi's power lies with the Divi builder and the unlimited options for theme settings. 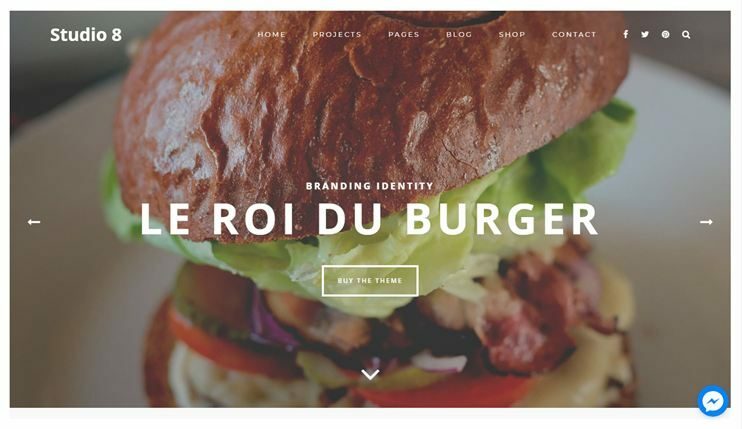 Create unlimited designs with the Divi builder and the page components. There are a few pre designed demos you can choose from. The basic design of this theme is clean and elegant. The elements display smooth and eye pleasing animation effects. So, if you are creative and enthusiastic non-techie and want to try your hand at website creation, Divi is for you. 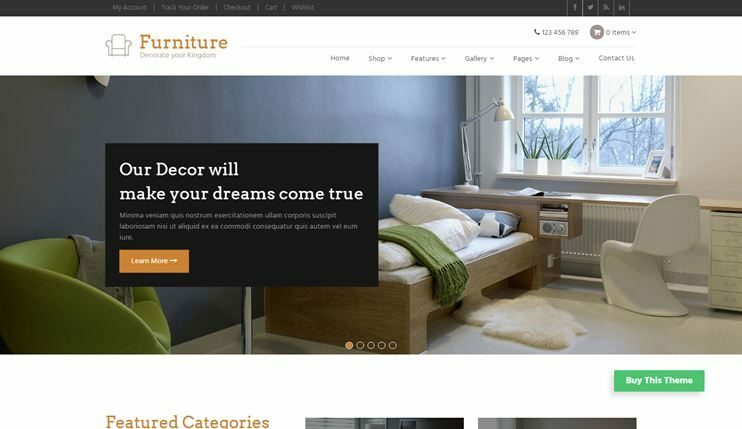 This is truly the ultimate WordPress theme for Furniture which comes packed with loads of features. This theme has everything to give you the perfect tools and stylish design for a great and profitable furniture website. The powerful functionalities and elegant design will help keep your customers longer on your website for. The theme’s features and functions are specially crafted to create a great looking website for furniture, interior design, electronic stores and multi-purpose open cart sites! 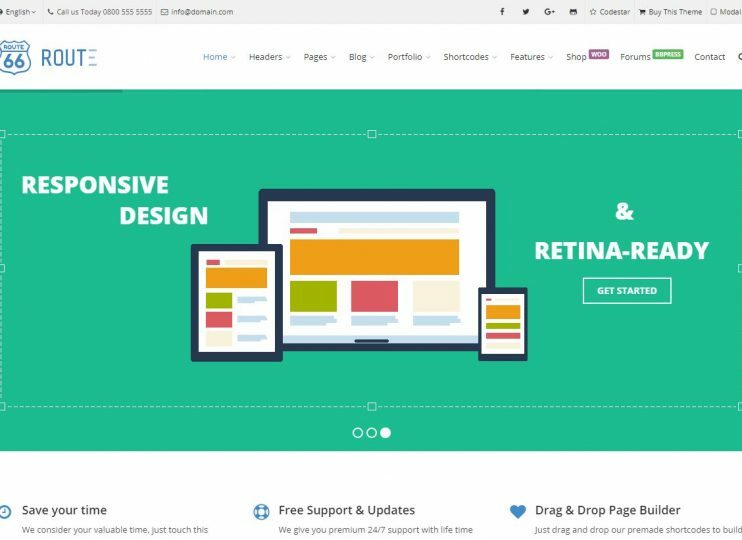 This beautiful, elegant and powerful theme has been designed to give your customers and visitors a great user experience while browsing your website. 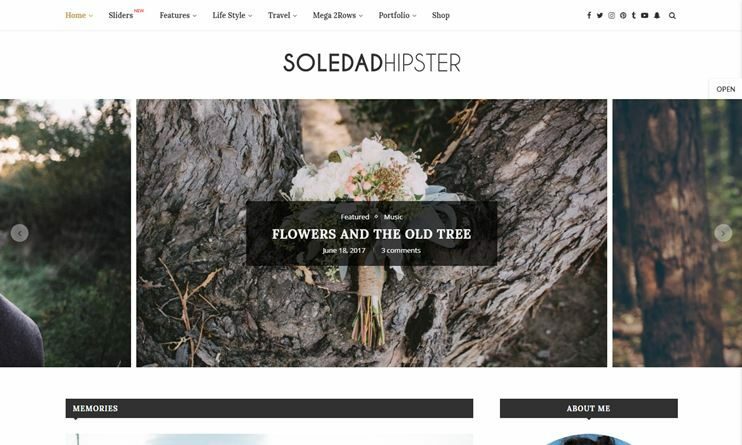 Soledad is one of the most clean and minimal wordpress themes. It is multipurpose theme with unlimited possibilities. With soledad you can choose from more than 250 homepage demos. You have the live customizer with many options to customize the theme. It allows Visual composer for page building. Moreover you can use the add ons for extended features. 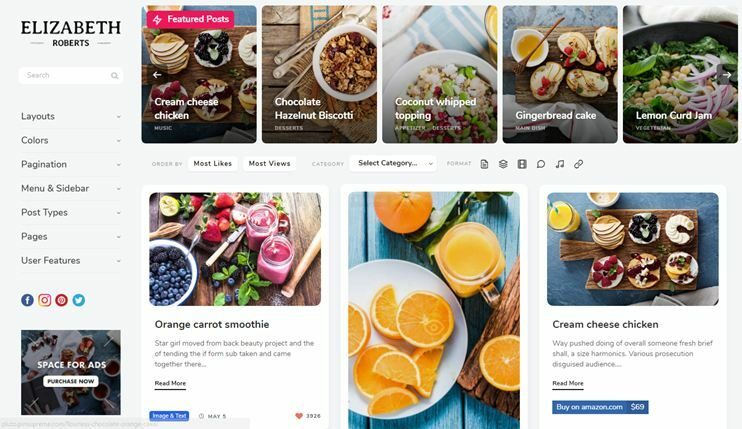 If you want a reviews website, you can use the review plugin, for food bloggers you have a recipe plugin. This theme is also compatible with the WooCommerce plugin for ecommerce features. This theme is simple, highly customizable and flexible. Oshine is a creative yet simple wordpress themes. It has advanced features and abundant options for customization, but it is still very easy to use. Oshine has about 25 demos to choose from. The theme can be used for creating a clean photography portfolio website or a blog site. Onshine comes with awesome portfolio options. Pages can be created with the inbuilt powerful drag and drop page builder. Customization is possible with the intuitive options. For ecommerce and eshop features in your website, you can use the WooCommerce plugin. 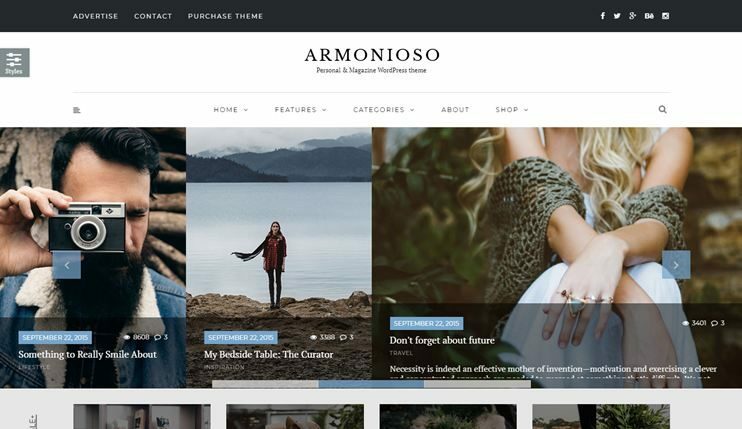 Armonioso is a personal blog and magazine theme. It is a clean and flexible theme. It comes with abundant customization options to make the theme look the way you want. You can choose the blog layout for your website. You can choose from the available homepage variants. The theme lets you select from the 12 predefined skin and allows to create more. The theme is optimized for speedier performance. This theme is elegant, easy to use and best for personal blogging. Pluto is a clean and minimal WordPress theme for 2018. It is a theme for personal blog. The theme can be used for creating any kind of website. If you create a photography portfolio website, the theme allows you to protect the photographs. With the powerful admin options you can change the theme settings very easily. To earn through your website, you can use the multiple ad spaces in your website. The theme also allows a reading mode that allows visitors an environment for easy reading. The theme is SEO optimized too. 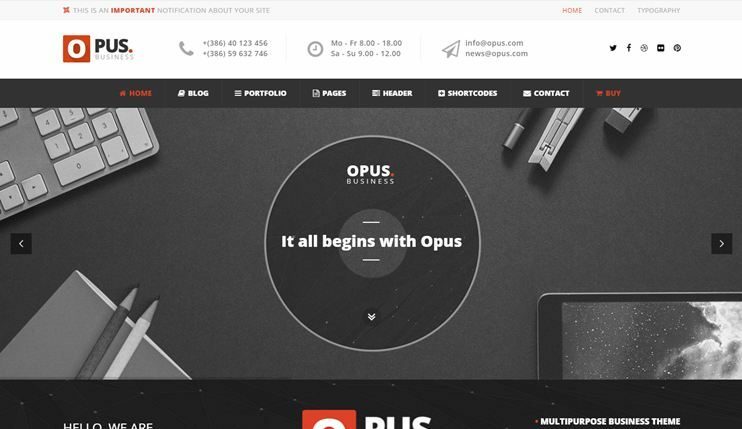 Opus is a creative and simple blog WordPress theme. It is a rather simple theme. It can be used to create a corporate business website or a blog website. There a drag and drop page builder allows you to create pages for your website. You can choose from the unlimited homepage layouts. The theme has options for portfolios and blogs. You have more than 100 shortcodes. The theme is SEO and speed optimized. If you want to create a simple blog website that loads the content instantly, this theme is worth a try. Om is a stylish photoblogging WordPress theme. You can use this theme to create a blog website that uses text and images for telling stories perfectly. It provides you enough customization options. So, you can make changes to the appearance of your website. You can choose from one of the three layout options for your blogs. You can use Gravity forms to create forms for your website. 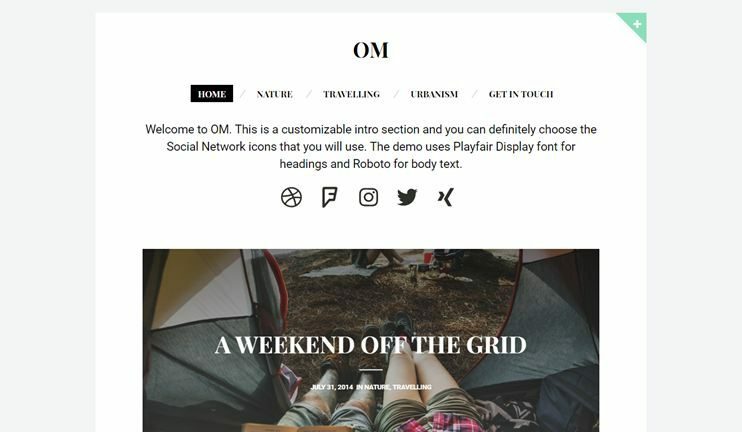 Om is a perfect blog theme with perfectly good looks. Route is a responsive and minimalist WordPress theme. It has a multipurpose WordPress theme. It can be used to create a corporate business website or a shop or a portfolio. You can create pages for your website using the drag and drop visual composer page builder. This theme allows you to create a one page or a multipage website. It looks beautiful with the video and parallax backgrounds. With the powerful options available at the backend, managing the theme is very easy. The theme allows WooCommerce integration for ecommerce features. Route is SEO and speed optimized. Want a simple and sober directory theme? 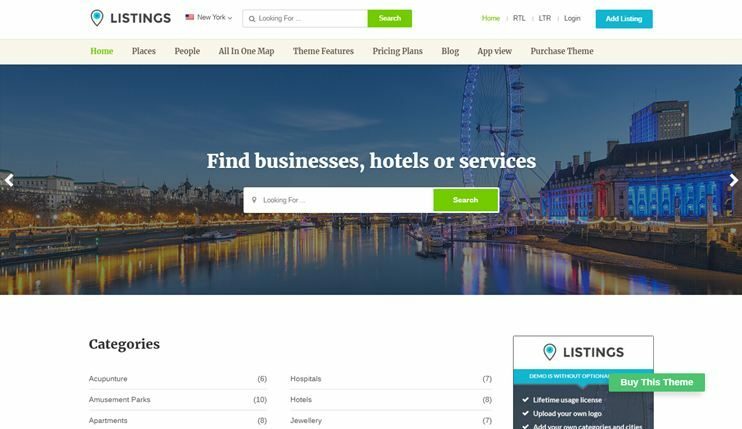 Listings WordPress themes is designed to help you create, manage and monetize a listings directory site for literally any purpose. You can build an online business directory which allows various businesses such as Car dealers, real estate agents, hotels, restaurants, tourism companies to submit listings. This theme comes with many powerful built-in functions such as free or paid packages, unlimited custom fields, categories, cities and it’s very easily customizable. The Listings theme is child themes of the powerful Directory Theme. It id Designed for business or niche directory websites, you can use Listings for almost any type of directory you can throw at it. 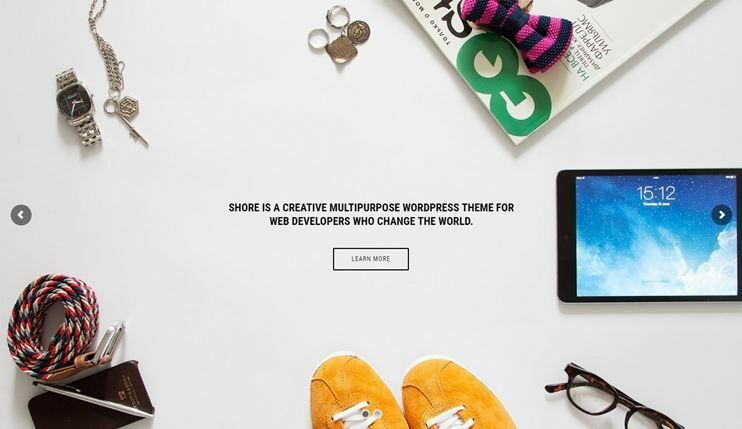 Shore is a multi purpose theme with a clean and minimal design. The theme comes with layout options to choose from. It has an eye pleasing design with utility based sections. For ecommerce you can use the WooCommerce plugin. Create desired pages with the drag and drop page builder. With shore you have abundant customization options. The theme is SEO and speed optimized. It can be used to create a comprehensive business websites that focuses on content. Pile is a simple and elegant multipurpose WordPress theme. It is a highly customizable theme that can be used for almost any niche. The theme comes with a page builder to let you create pages. 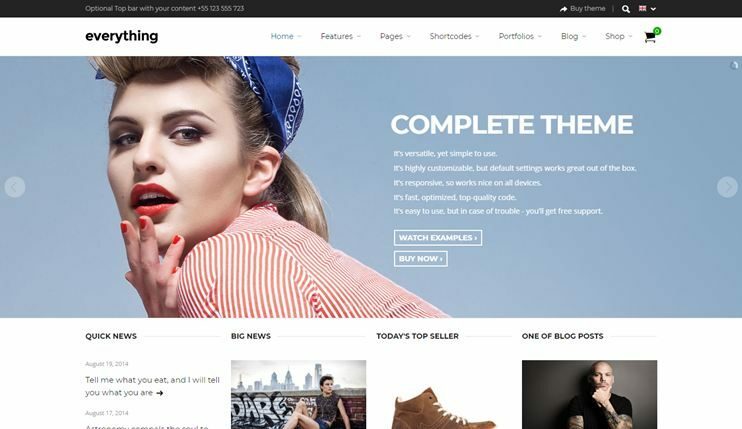 For creating a shop using pile theme you can use the WooCommerce plugin. This theme is elegant. 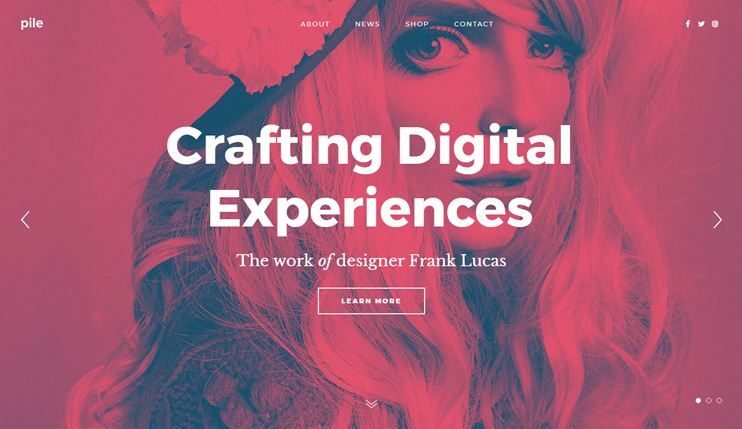 You can use this theme if you want to create a beautiful and comprehensive portfolio website. 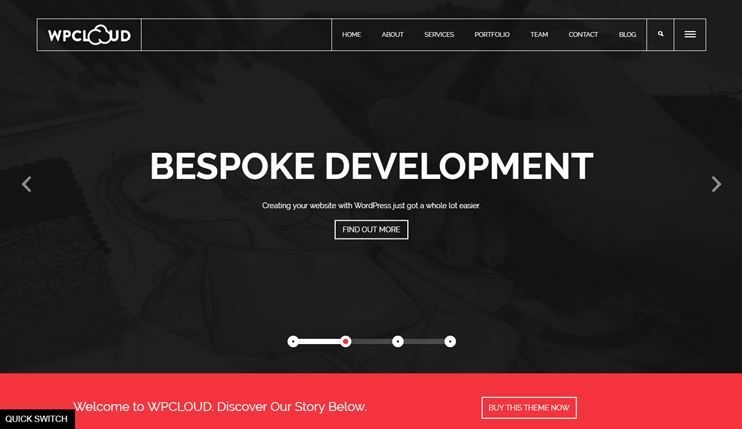 WPCloud is a theme with a one page styled design. It can be used to create portfolio websites for designers, photographers, blogging, etc. It can also be used to create a product page or a landing page. Create unlimited pages with the help of drag and drop page builder. The theme is highly customizable and very easy to use. The theme allows you to create portfolio galleries for your website. It is SEO optimized too. 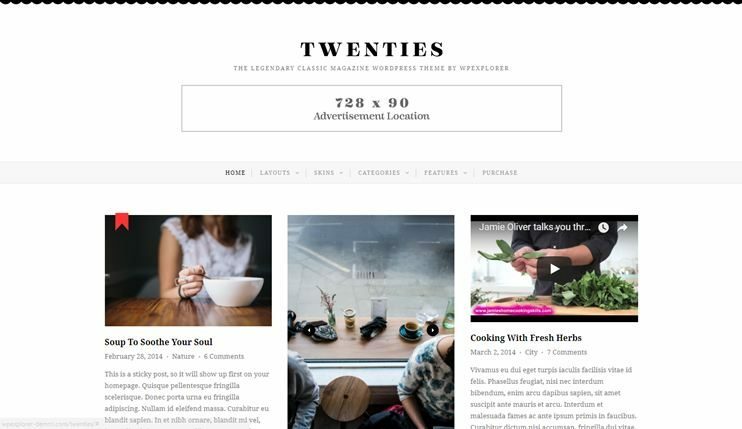 Twenties is one of the clean WordPress blog themes. The theme lets you create a perfect blog website. The theme can be customized with the live customizer. Twenties is SEO optimized. Twenties comes with all the basic features needed for a blog website. The theme comes with inbuilt advertisement spaces. It also offers you some utility based custom widgets. 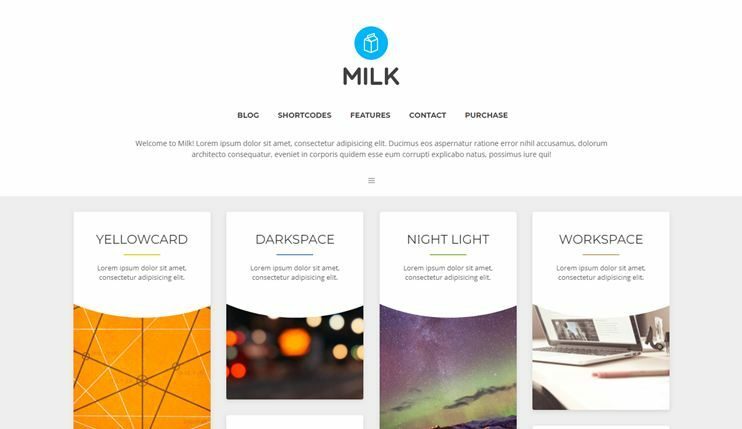 Milk is a multipurpose portfolio WordPress theme. It has a simple design with beautiful hover and transition animations. It can be used by photographers, designers and creative people to display their portfolio. The theme can be efficiently customized using the live customizer. You can choose from the unlimited color options for the theme. You can easily change the typography of the theme. 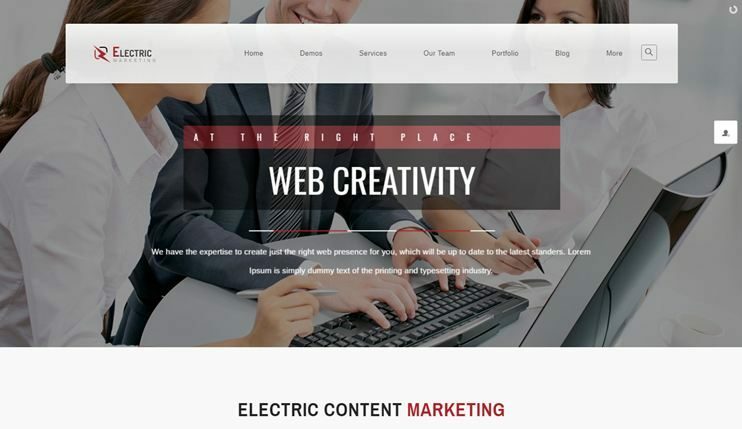 Electric is a general purpose WordPress theme. It comes with multiple ready to use demo designs. The theme is multipurpose. You can use visual composer for page building. There are multiple options for portfolio layouts. The theme has a simple look but it is too flexible. You can customize it with the easiest options. For ecommerce features, you can use the WooCommerce plugin too. Brixton has a clear and innovative design. It is a theme designed for blogging. You can use this theme for creating any kind of blog, informational or corporate website. Brixton's code is speed optimized so your website will load fast. There are enough customization options available in the theme. The theme is SEO optimized. 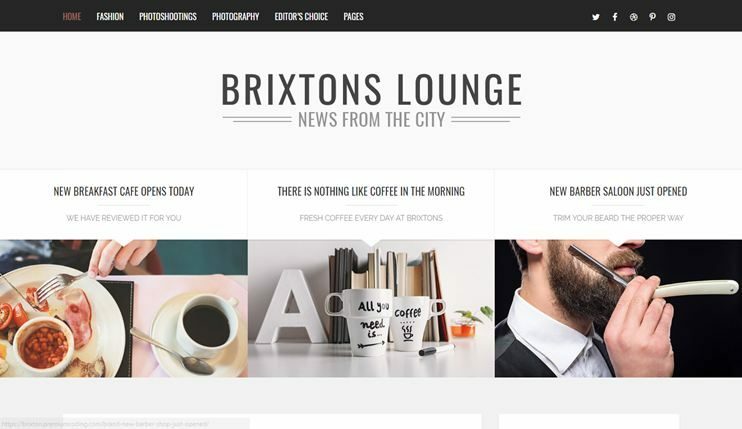 With Brixton you can create a wonderful blog website. Xenia is a simple and minimal corporate WordPress theme. It can be used to create a business website. It is a general purpose theme that can be used for different niches. The theme is easy to customize and redesign. You can create pages with the drag and drop visual composer page builder. The theme is SEO ready. With this theme you can create a website & display your business details elegantly and clearly. You can also integrate WooCommerce in the theme for ecommerce facilities. The themes listed in the article are some of the best clean and minimal WordPress themes for 2018. These themes are designed to focus on the content. They are comparatively easier to use and maintain. We've mention only few important traits of these themes. You can check the other features by visiting the sales page for the theme. So, get yourself one of these clean and simple WordPress themes and create a website for yourself.